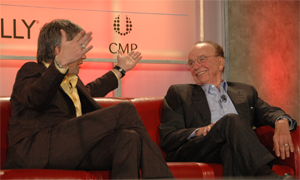 Rupert Murdoch and MySpace co-founder Chris DeWolfe announced some of their plans around the MySpace Platform (rumored since last week) this evening at the Web 2.0 conference during a Q&A with John Battelle. The platform is clearly a response to, and will eventually largely mirror, the Facebook Platform, which launched in May and has led to the creation of thousands of third party applications on Facebook . MySpace is taking a staged approach to the launch, however, which may help them avoid some of the growing pains that Facebook has had to deal with over the summer. New privacy controls were also discussed this evening. More details on each below. In the next couple of weeks MySpace will release a directory of existing third party widgets to help users find good content to add to their MySpace page. Advertising can be included on the application pages (called control pages) and developers will keep 100% of the revenue. Ads may not be placed within widgets that appear on MySpace pages, however. Platform applications will not be available to all MySpace users right away. They’ll have a beta period that includes just 1-2 million MySpace users who’ll be able to access the applications. After a beta period applications will be available to all MySpace users. Like Facebook, MySpace will soon allow the notion of different types of friends (family, friends, business contacts, etc). When accepting someone as a friend, you can also set the friend type. When that person visits your MySpace profile, the information they see will be based on the type of friend you are – resume type stuff for business contacts, drunken frat party antics for your college friends, etc. Update: $300 million in profit next year for MySpace? In response to a question, Murdoch said News Corp. should generate $5 billion or so in ebitda next year “if the economy half holds up.” He then said MySpace should contribute “$200-$300 million” of that.